Submitter: I don’t know how this escaped being weeded before, but it was probably due to its slim size (only 130 pages) and pristine condition (never checked out!). 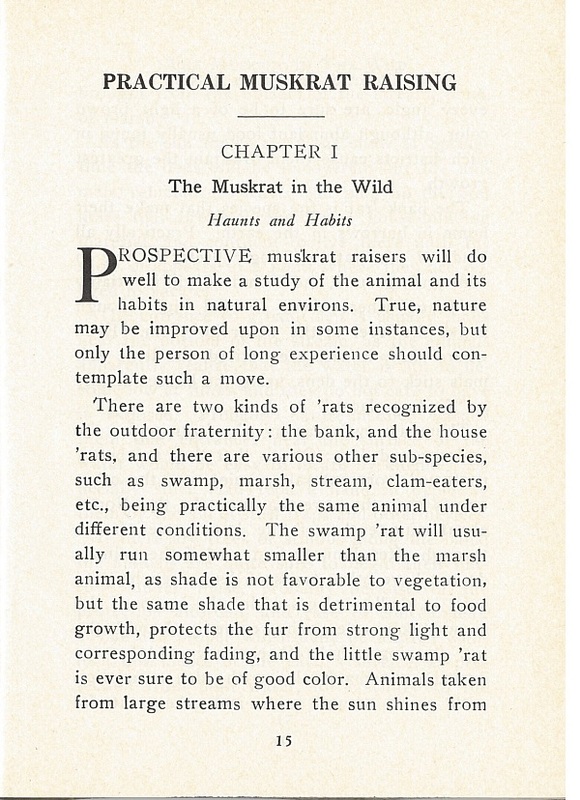 We’re a public library in a fairly rural area where muskrats are a native species, so topics like trapping might be of interest, but the information is so dated. Attitudes towards wearing fur have changed, and I’m sure there are regulations about starting a muskrat fur farm today that aren’t even addressed. 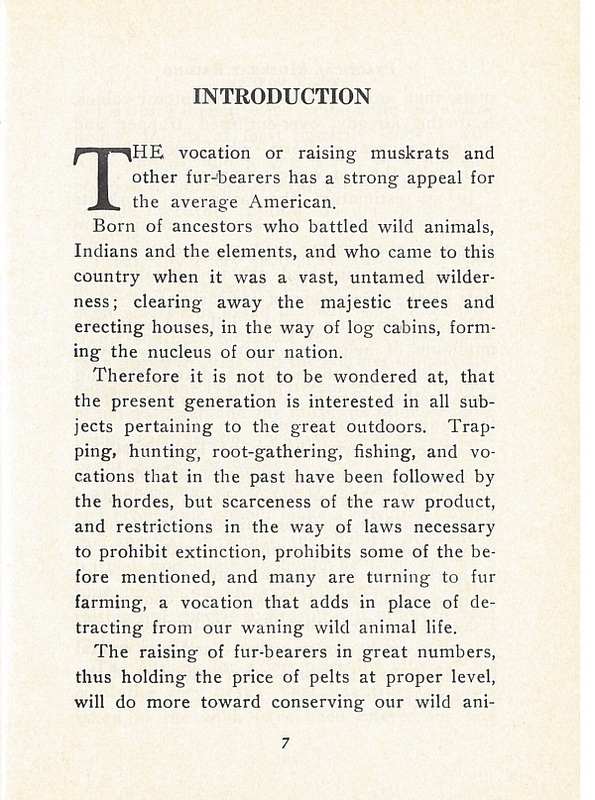 I love the opening statement “The vocation of raising muskrats…has a strong appeal for the average American.” Yeah, we talk about our interest in raising muskrats every day around here. Not! 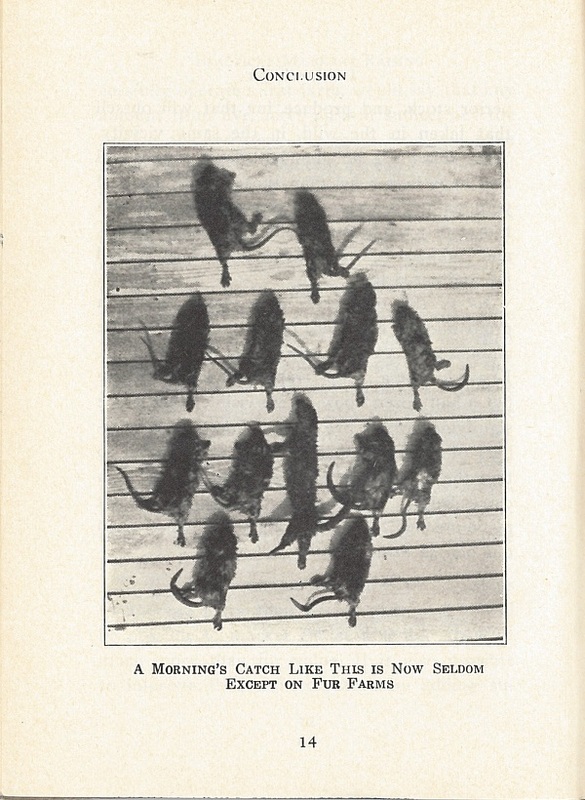 And the book’s way of constantly referring to them as ‘rats makes the thought of a muskrat fur coat extra appealing. The really embarrassing part? We have a second copy at one of this at one of our branches! Holly: This book was probably great in its day. In addition to Submitter’s points, I will add that it suffers from that old-timey formal, stilted language. 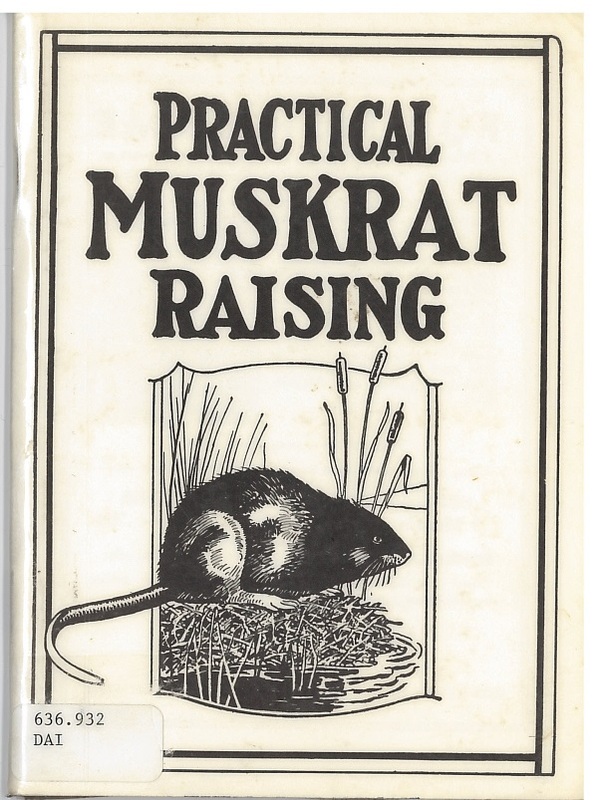 When we see a title like “Practical Muskrat Raising” these days, we expect something much more approachable. Heads up: dead muskrats pictured below. Click through at your own risk! Also, sewing all those little furs together? Wouldn’t it be bumpy? Also, having people know you were wearing a _muskrat_ coat? Or anything -rat? “Mushrat” in the South. That’s worse. There was a chinchilla raising fad possibly near the same time. I believe ALB featured a book about it. Oops, yes, the chinchilla book is referenced. Sorry. All fur coats are made from sewing together small blocks or strips of pelt. This design lets the coat move freely — solid pelts would be too stiff. The sewing is expertly done and you’d never know it from the outside. Muskrat and other rodent furs are usually sold under prettier-sounding names. Wikipedia gives “Hudson seal” and “river mink” as typical sales names for muskrat fur. With a “mornings catch” like that who needs anything more? Sometimes weeding is not enough–shredding is a recommended action! Yikes! I didn’t realize muskrats were farmed! 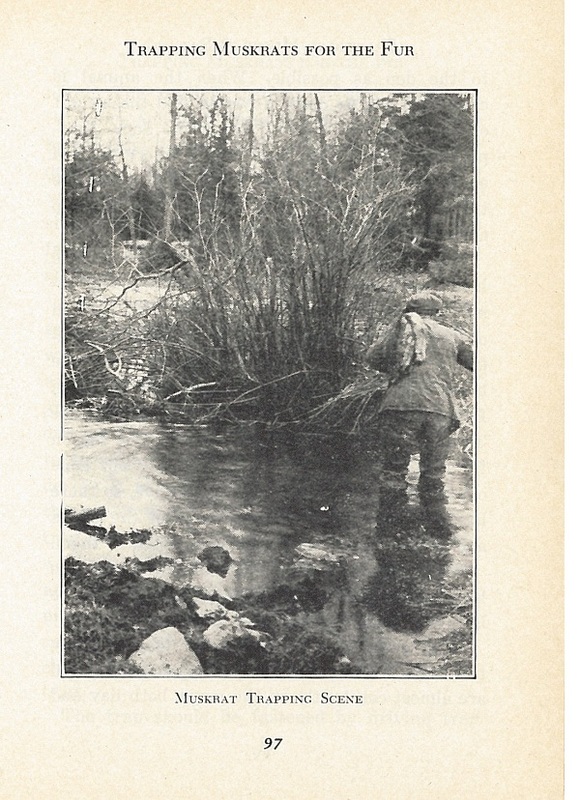 My grandma still has a muskrat trap from my great-grandfather (or was it my great-great grandfather?). 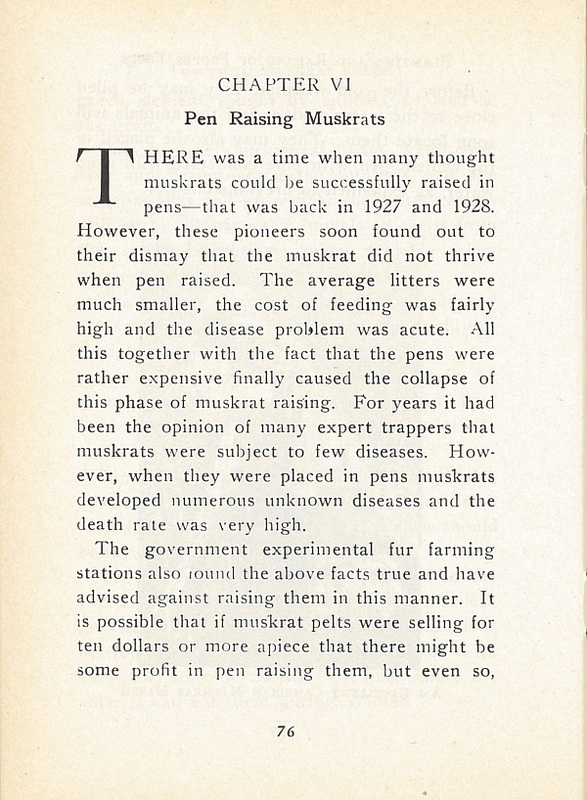 I like that it says pen farming would be more profitable if pelts were selling for ten dollars or more. Even with inflation, that must have been the golden age of cheap fur coats! I remember my aunt once had a muskrat fur coat. That was way back in the horse-and-buggy days better known as the early 1980’s. Actually I grew up in the country where my mother told me it wasn’t that long ago before that some people still traveled by horse on a dirt road. Woah. I think my mother did have a muskrat coat. It was kind of an entry-level fur back in the 1930s and 40s. She had it in high school or college. I think it was more dressy than raccoon, being finer and shorter fur and probably easier to tailor. Bulky raccoon went to sporting events. Reminds me of my grandmother who still had the dressing boards for stretching out the individual coats on. Her husband’s brother, if I remember right, was the one who did it. My first thought, upon seeing that book: The Captain and Tennille! Me too. What is even sadder is that I probably know the lyrics. When I saw the thumbnail picture of the book cover my first thought was: what is impractical muskrat raising like? They needed a good editor too. The language is not only stiff and arcaic, but there’s some grammatical errors too. Seriously – a typo in the first line of the Introduction is pretty bad!